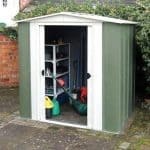 We found this to be a very good looking metal shed, but for those looking for a compact shed for their garden or patio this offers more than just an attractive dark green colour scheme. 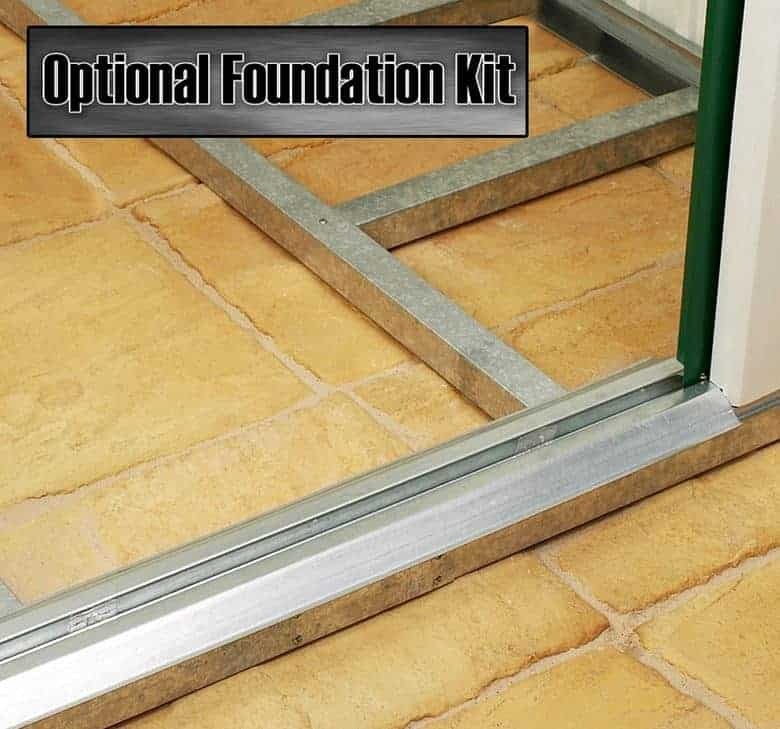 Easy to install upon a suitable pre-existing concrete foundation, it can then be relied upon for at least the next 10 years, thanks to the manufacturer’s non-perforation guarantee. This shed is designed with weather resistance in mind. The apex roof is the first line of this defence, channeling rainwater away, but the main protection comes the cladding itself. 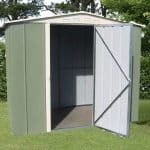 Made of hot dipped galvanised steel, it’s very resistant to rust, and it’s also surprisingly strong when constructed for such a lightweight shed. Heat can also have an adverse effect upon a metal shed, and the contents inside. That’s why we liked the double ventilation panels in the gable end, allowing a good flow of air inside the shed, and preventing an excessive build up of heat. That makes it much more comfortable to spend time in as well, although you have to be careful when stooping to enter the short sliding doors. A neat integrated ramp, however, makes it relatively easy to move objects in and out of this good value shed. 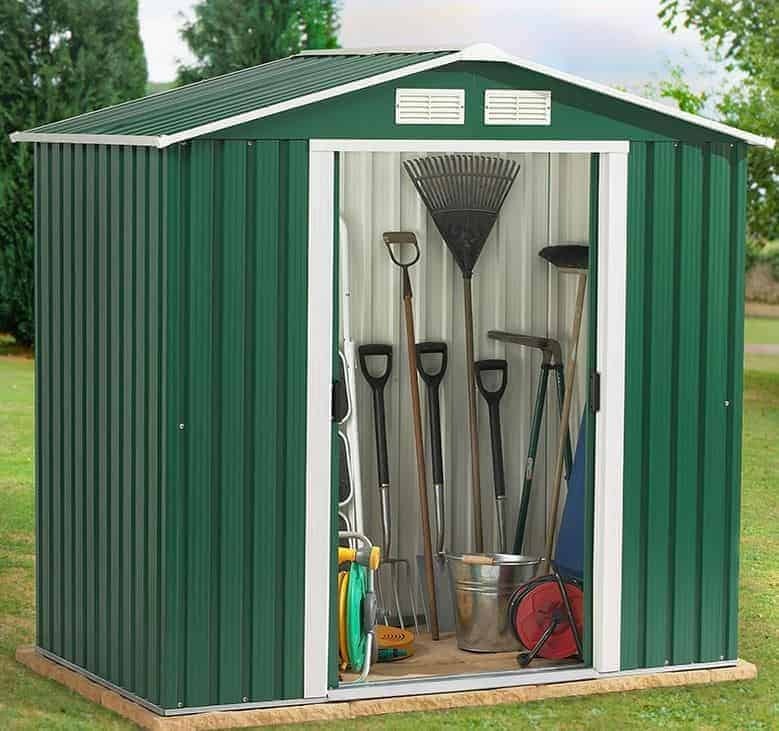 Compact metal sheds such as this are becoming an increasingly popular storage solution, and it’s easy to understand why as they offer significant advantages over wooden sheds when it comes to the amount of work needed to keep them looking good. 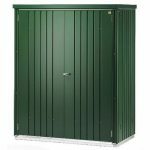 One of our first impressions was that this is a very striking metal shed, thanks to its dark green colour and contrasting white details. The paint was well applied, and will itself help to keep rain away from the metal cladding. We liked the fact that this shed featured a water repelling apex roof, always a much needed feature on smaller sheds, yet we would still have preferred the shed to be a little taller. The ridge height is 1.89m, with an eaves height of 1.6m. The width of the shed at the base is 1.95m and the depth at base is 1.13m, so these are the dimensions you’ll have to keep in mind when finding a suitable location to site it. We were struck by how light this shed felt in its flat pack state, yet it was surprisingly solid when assembled, so we wouldn’t be worried about how it will stand up to wind. There are two reasons for this deceptive strength: the first is the hot dipped galvanisation that the core steel has been subjected to, and the second is the fact that the cladding has been mechanically folded during the fabrication process, increasing its strength and durability. There is no floor included with this shed, but it can easily be affixed to a flat area of concrete, or even a level patio area. If you don’t currently have a suitable area, the optional steel foundation kit will have to be purchased. Because we were so impressed by the folded and galvanised cladding, we were a little surprised that the manufacturer has only provided a 10 year warranty against perforations caused by rust. Even on budget level metal sheds, many manufacturers offer 12 year guarantees or even more. Nevertheless, it does provide the consumer with added peace of mind, particularly as there are no treatment requirements specified, and we wouldn’t be surprised to see this shed outlast the warranty period without rust damage appearing. We liked the width of this shed’s double doors, but felt they could have been taller even though they’re restricted by the height of the eaves. The doors slide effortlessly apart, and are situated on the interior of the cladding, giving extra security and creating a more pleasing appearance as well. When fully opened they have a width of 0.90m and a height of 1.54m. This width is more than we often find on similar sized sheds, making it easy to get tools and equipment in and out. Another aid to storage is the integrated ramp. We found it to be reassuringly strong underfoot, and it runs across the full width of the door, making it ideal if you use a trolley to load or unload goods. When reviewing sheds without windows, we sometimes find that they become uncomfortably stuffy and humid. That’s certainly not a problem here, as the generously sized ventilation grills, double mounted on the gable, let a good flow of air into the shed. This is good news for you, and for any items stored within. We were pleased to see that the handles of this shed are holed, as this makes it padlock ready, although it would have been even better if a padlock had been included as standard. Shed security is, however, enhanced by the exclusion of windows. This feature means that the contents of the shed are hidden from those outside, which can be a vital aid against shed crime. Not everyone has a suitably level area of concrete that is also in a good position to site a shed, so it would have been good for a foundation creating kit to have been supplied as standard. There is just such a kit, however, as an optional extra. 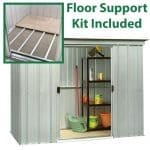 It costs £50, but has everything need to quickly put together a lasting and stable base for your new shed. We found that it took just under ten standard bags of dry mix to make enough concrete for the foundations. We were impressed by the stability that this shed achieves despite its relatively thin and lightweight cladding, which shows the quality of the fabrication and the components used. Both the apex roof and the galvanised cladding help to keep rust at bay, but it would have been nice to see this backed by a longer guarantee. We had to bend down to get through the doorway, which is just over 5 foot, and although there was more room inside it can still seem a little cramped. This is very easy to install with two people, so we would advise setting aside up to six hours for this purpose. 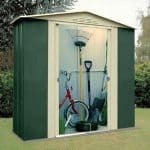 This is a good value shed, especially when helpful features such as the ramp and ventilation are taken into consideration. 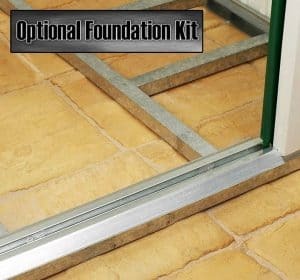 If the foundation kit is required, however, the cost is a considerable further expense. 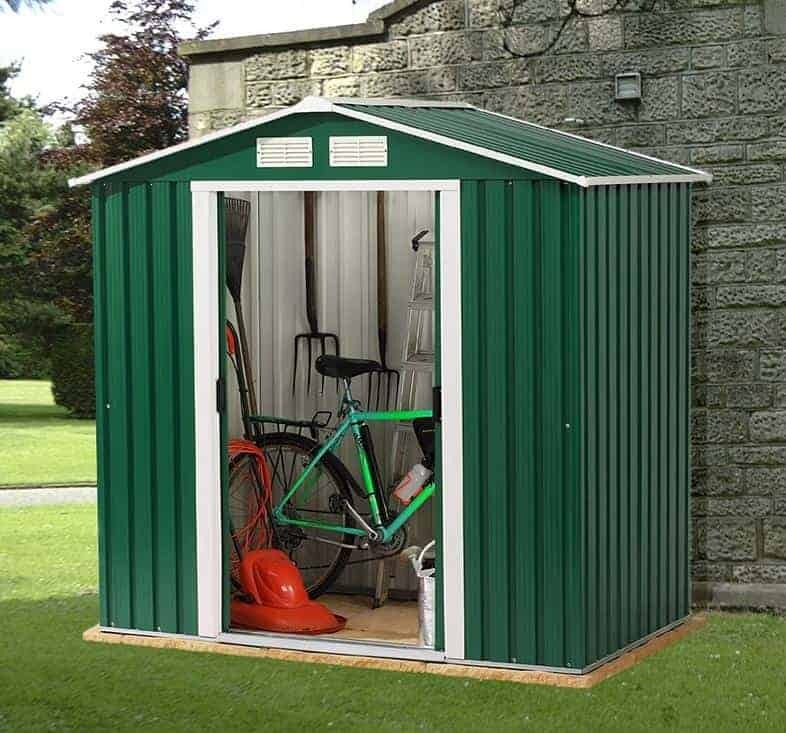 Final Thoughts: The green colour scheme is one of the most attractive we’ve seen on a metal shed, and so it could convert people who have previously used only timber garden buildings. They’ll find it a handy storage option that doesn’t require anything other than a quick and easy installation, so it’s ideal for people who simply want to move things in and out, rather than looking for a shed to spend time in. We liked the addition of the ramp, and the ventilation was some of the best we’ve seen on a low price metal shed. This makes a big difference on a summer’s day, and the shed is also very rain resistant thanks to its apex roof and galvanised cladding.